Ben Carson has performed groundbreaking surgeries over the course of his medical career. He’s treated dozens of children and even told PBS back in 2008 that he builds “special relations” with long-term patients. Nevertheless, Carson doesn’t seem to understand how kids work. 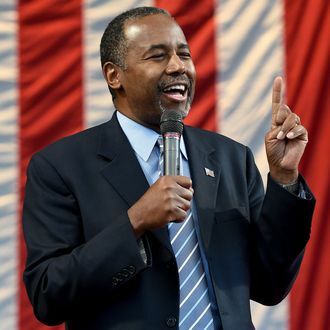 Exhibit A: On a routine campaign stop at Isaac Newton Christian Academy in Iowa, Carson tried to ask the crowd — composed mostly of elementary-school-age children — a rhetorical question. “As a fifth-grade student, I was a horrible student,” he told the crowd. “Anybody here in fifth grade?” A large group of fifth-graders seated together in the bleachers raised their hands. “Who’s the worst student?” Carson asked. W/ crowd of 500 @RealBenCarson just called out to 5th grade class: who's dumbest kid in class? At least half dozen kids point to 1 student. The question was meant as a lead-in to a charmingly self-deprecating story about how he, Ben Carson, was once referred to as the dumbest kid in the class, and wow, look how far he’s come! But before he could get on with the anecdote about a dozen fifth-graders all pointed to one kid, instantly creating the moment he’ll recount over and over to his future therapist. Carson went on to regale the audience with tales of his prowess as a brain surgeon.
.@RealBenCarson just told Cedar Rapids audience he could drill into their hippocampi & make them remember every word of book read 60yrs ago. Never mind your hopes and dreams, kid — it’s brain surgery or nothing. Got it? Good. He’s so great with kids.